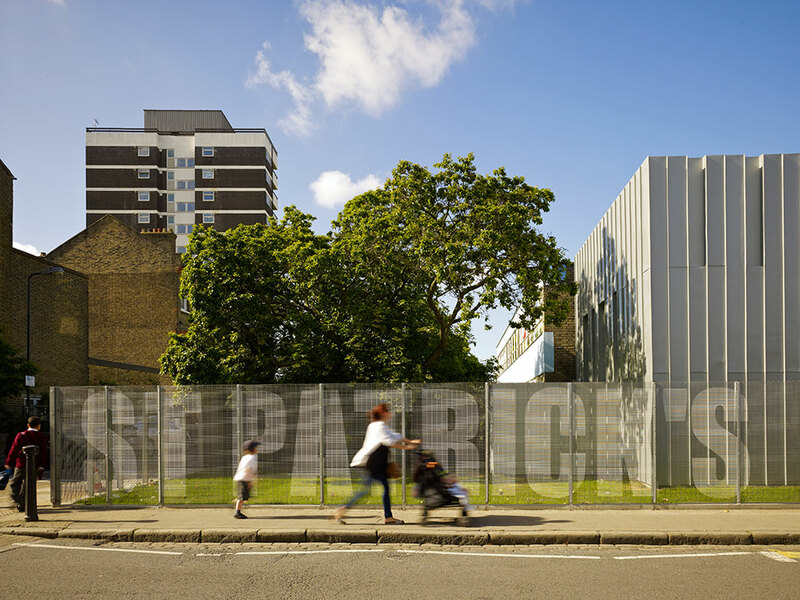 The project, which went on to win the Stephen Lawrence Prize for Architecture, was to build a small extension to an existing school to house its library, music store and one or two other functions. The competition brief initially asked for the extension to be built on the roof. However, we instantly saw a better solution by extending to the side facing the road. This had multiple benefits. As well as fulfilling the original brief, it set up opportunities for outdoor teaching and to resolve some ongoing issues connected to the main entrance. Beyond that, it would forge a better physical and symbolic link between the school and its local community. On a practical level, a separate building meant the project wouldn’t be subject to VAT. Having won the commission, we involved pupils in the early design process by activating their imaginations for what the space could be. The resulting 50 m2 Book Box design melds their wishes with the school’s needs, adding considerable extra value. The entrance is flooded with calming light filtered through stained glass. Constructed from birch ply, bookcases and benches are at one with the structure. The space can be opened up to the outside to become a space for performances or sheltered outdoor learning. The space sets the conditions for academic achievement. It is both calming and stimulating. The brief initially asked for the school extension to be placed on the roof, but Coffey Architects proposed to put the new addition next to the school towards the road instead due to our belief that this would lead to added benefits. The proposed location makes a significant difference to the school in terms of its place in the community, its relationship to parents and ongoing entrance issues, the possibility of relating to external teaching spaces and, most importantly, it has led to a wonderful space to inspire children that they can relate to as the symbol of their school. The location has also meant it successfully connects the school to the immediate townscape, as well as creating a stronger relationship with the existing school building and its playground. Additionally creating a separate building has meant the project hasn't been subject to VAT. The whole of interior is constructed from birch ply, including the bookcases and benches which become one with the structure. The first floor music store hangs from plywood portal frames with stainless steel hangers, which in turn support the glazed balustrade. The gantry is held away from the sides of the building so it appears to float, and the hangers are delicately and discretely tied back into the portal columns. The bookcase is a large piece of joinery that connects the stair, the natural ventilation louvers and supports the music store floor above. 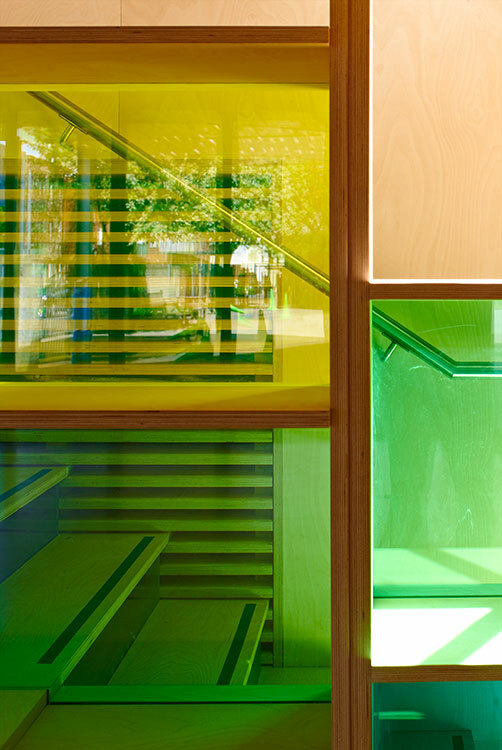 Made from birch plywood and green acrylic, it allow views through the windows to a Japanese cherry tree at the rear. School Pupils were involved in the early design process. They were asked to draw the best and silliest places to read a book. 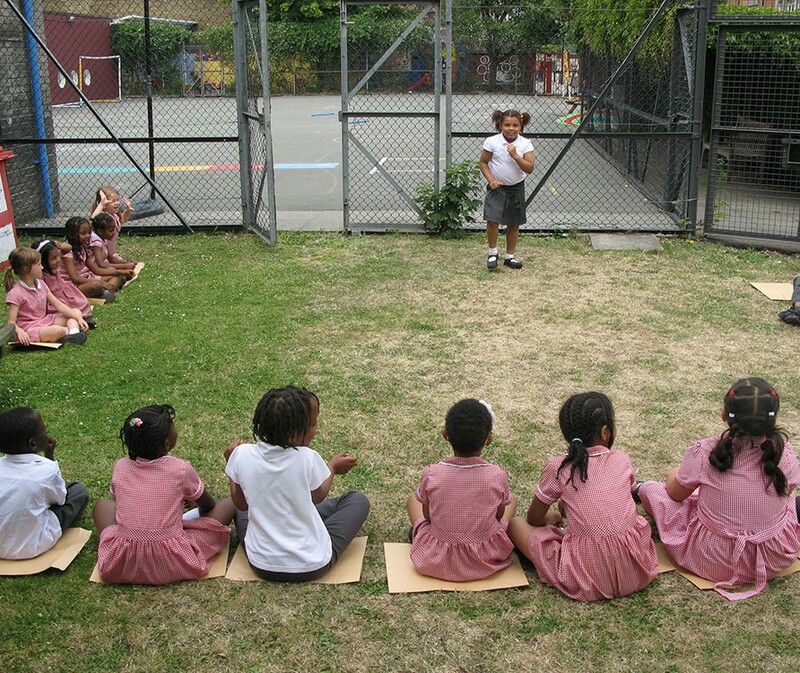 Pupils were also taken outside to sit, read and play in the proposed location of the building, connecting them with the space and the idea of having a new special room. The space can be opened up to the outside working as a performance space. The interior joinery provides a backdrop to the 'stage' when an audience watches from under the external canopy. The canopy represents a tree, a place to sit under and learn, with the CNC pattern cut into the plywood creating an abstract image of the eisting tree to the east.